We’re excited to announce Day in the Bay 2019, our 12th annual business to business community event here in Williams Bay. 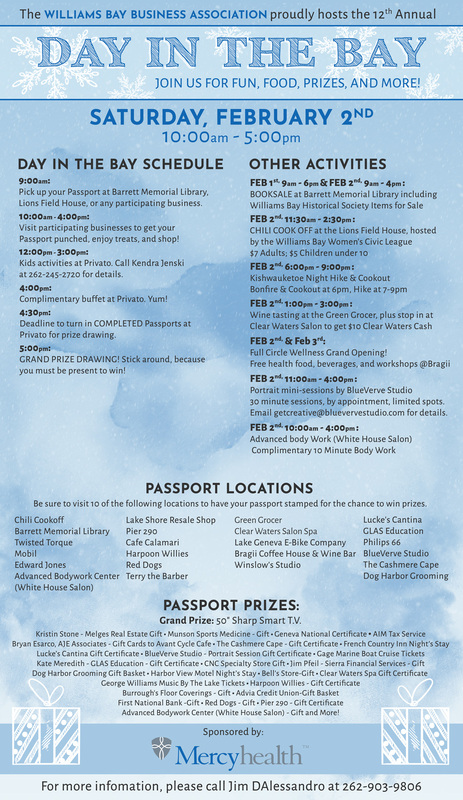 If you’re in the area for the Lake Geneva Ice Castles, be sure to swing over to Williams Bay on Saturday, February 2nd, from 10am – 5pm, to take advantage of our great sales, events, and raffle! From a book sale at the Barrett Memorial Library, featuring items from the Williams Bay Historical Society, to the Chili Cook-Off at Lions Field House (that’s right, bring your hungry! ), Day in the Bay will be full of fun activities for the whole family. Have kiddos who are suffering from cabin fever? Bring them down to Privato from 12pm – 3pm for an afternoon full of activities. At 4pm, Privato will also host a complimentary buffet that will run until our raffle at 5pm. All of the details are listed below, and we look forward to seeing you around The Bay!